This is a list of horror movies I watch on a semi-constant basis with a few quick notes to remind me what they are when I forget. It is not intended as a detailed synoposis of those movies, and unless you're a dedicated fan of horror these movies probably won't entertain you at all. Note: I made this list in the car between Wausau and Dr. Evermore's Forevertron in North Freedom, Wisconsin. I'm in the early stages of memory loss, and it's just a list, folks. It's meant as a tribute to all the low budget horror films that have meant so much to me all my life, not something to fight about, but I'd enjoy it if others wanted to talk about any of these films or similar ones that have meaning to them. Maybe some of these movies will help you get through some hard times and dark nights with their unpretentious devotion to the genre the way they have for me. 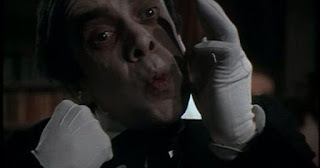 1) Screamtime: Anthology piece shot in Britain, but with introductory segment shot in New York. Has the gnomes story I really enjoy. 2) Nightmares: Anthology piece with Emilio Estevez in the Bishop of Battle segment. 3) Point of Terror: Peter Carpenter vehicle about a small time lounge singer who has aspirations of being a star. 4) Night of Horror: Confederate zombies pursue a rocker and his friends. 5) Werewolves On Wheels: Great soundtrack by Don Gere. Biker werewolves who take on a Satanic cult. 6) Enter the Devil: Wonderful regional B movie shot in Texas and with a unique take on the Satanic cult genre. 7) The Offspring (From a Whisper To a Scream): Awesome Vincent Price anthology piece about Oldfield, a Southern town where the sins of the past always come back to haunt those in the present. 8) Toxic Zombies: Pot growers crop dusted by the DEA transform into zombies and pursue those unlucky enough to be anywhere in the vicinity. 9) No Blade of Grass: Stark, cynical assessment of human nature after an environmental disaster plunges humanity into chaos. 10) Children Shouldn't Play With Dead Things: Favorite movie. A theatre troupe of young Hippies land on a small island with a cemetery to perform a Satanic ritual meant to raise the dead. It works. "So what's with this little thing we're askin'?" 11) Shockwaves: Aquatic Nazi zombies rise from their shipwreck to hunt down members of a shipwrecked crew on an island with an abandoned resort which Peter Cushing lives in. 12) Psychomania: Biker gang punk learns secret of immortality from his psychic mother. 13) Mansion of the Living Dead: Incredibly misogynistic Jess Franco movie starring another island resort and living dead reminiscent of Ossorio's Blind Dead. 14) Revenge of the Dead: French movie mistaken for a zombie movie by those disappointed it's really a mystery with another abandoned spa and only one zombie. 15) City of the Walking Dead: Probably the first fast-moving zombie movie. 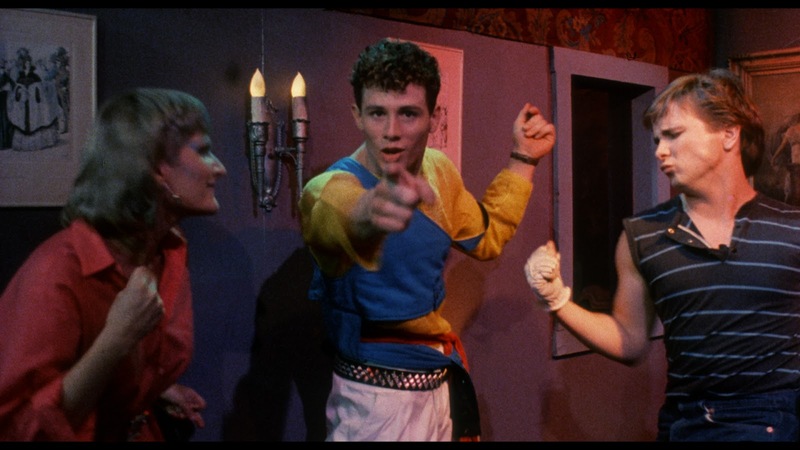 16) The Monster Club: Co-favorite movie of all time. Vincent Price in another anthology piece set in a London night club for monsters. What happens if a Shadmock whistles? 17) Alabama's Ghost: Bizarre piece of nonsense released as a Thriller Video hosted by Elvira directed by a scuplter. 18) The Spookies: A car-wrecked group of goofs happen upon an abandoned house that really isn't bandoned. 19) The Phantom of the Paradise: Paul Williams as Faust. 20) Scream and Scream Again: Price, Lee, Cushing. 21) Dracula 1972 A.D.: Chhristopher Lee as a Dracula in swinging London. 22) Escapes: Quaint but charming low budget anthology piece "hosted" by Vincent Price with the great Cup of Joe segment. 23) Pigs: First saw on Movie Macabre. An on-the-run mental patient meets the only other person crazier than her at a remote diner that serves the meat of pigs that survive on human flesh. 24) Gargoyles: ABC movie of the week in early 70's about the re-awakening of ancient gargoyles in the Southwestern desert. 25) Messiah of Evil (Dead People): Eerie, atmospheric movie about the return of the Red Moon to Point Doom, California. Great scenes at the theatre and Ralphs. 26) Simon, King of theWitches: Written by a real expert on witchcraft, avoids many of the cliche tropes of movies about witches. 27) The Cold: Shot at the now demolished Northernaire Resort in Wisconsin, the tale of three oldsters who invite several strangers to their resort off season every year to play a deadly game. William Rebane directs. 28) Zombiethon: Compiled footage from several zombie movies sliced together with several amusing interstitial shorts. 29) Night of the Comet: Against inconceivable odds, two sisters in different locations survive a meteor cataclysm. 30) Dr. Heckyll and Mr. Hype: Oliver Reed in an unusual retelling of the famous horror story. 31) Class Reunion Massacre: Shot in a Southern military academy, several people gather for a high school reunion. You know the rest. 32) The Beast Must Die: Werewolf mystery. Who is the werewolf? Who isn't the werewolf? 33) House of the Dead (Alien Zone): The original House of the Dead, shot in Omaha. A low budget anthology piece about a pilandering convention goer being shown the wages of sin by an undertaker. 34) Joel M. Reed's Bloodbath: Great anthology piece. 35) Funeral Home: Canadian horror movie about a young woman who goes to stay with her grandmother for the summer at the home where her grandfather was an undertaker. 36) Night Train To Terror: Bizarro anthology piece with the greatest musical intro of all time and Bull from Night Court in two of the segments. Everybody's got something to do. Everybody but you. 37) Ghost Ship: Nazi ghost ship. 39) A Name For Evil: Robert Culp as an architect who leaves the city to return to his ancestral home, but soon finds an angry ancestor doesn't want him there. 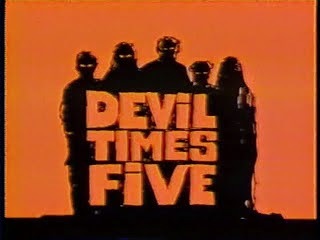 40) Satan's Children: Florida news guys swindles his friends to make this anti-Satan cautionary tale about a young man who leaves his broken home only to be raped by Molly Hatchet and then joins a Satanic cult. 41) The Boneyard: Phyllis Diller, Norman Fell, an offbeat lead character, and a zombie poodle in an oddly effective dark horror movie. 42) The Video Dead: A haunted television mistakenly sent to a California suburb unleashes a David Bowie zombie. 43) Creepshow 2: "Thanks for the ride, lady." 44) Ghostkeeper: Canadian snowmobilers are stranded at a abandoned resort. First Wendigo movie I am aware of. 45) Humongous: Canadian boaters are shipwrecked on an island where a Big Head Todd monster still lives in an abandoned resort. 46) Warlock Moon: A college girl is lured by a charming stranger to an abandoned resort where cannibals ply their trade. 47) Screams of a Winter Night: At an abandoned resort (getting the idea?) in Louisiana, a group of young college types trades urban legends, then becomes one. 49) Nightmare In Blood: The first horror con ever turns bloody when a movie vampire scheduled to appear turns out to be a vampire. 50) The Baby: A grown man is treated like a baby by his two sisters and mother. A truly unusual movie. It is horror. 51) Death By Dialogue: Almost forgot this gem, but that's why this list is here. A group of college student visit one of their uncles, who lives near an abandoned film set, and snooping in the basement finds a mysterious script whose contents come to life as they are read. One of the best decapitation by a heavy metal band one stumbles upon performing in the forest scenes ever. 52) Hellgate: A movie I used to confuse with Death By Dialogue because the settings seem so similar. Ron Palillo (Horshak from Welcome Back Kotter) is in this one about college students who end up in an abandoned Western Ghost Town attraction that comes back to life. Or something like that. 53) Tourist Trap: The Rifleman, Chuck Conners, owns a tourist trap wax museum. 54) Dead and Buried: For some reason had blocked this one from my memory, perhaps confusing it with something else, until a couple months ago, when I finally watched it, and will again, hopefully. Coastal town full of pyschos murders tourists and... little bit like The Fog or Messiah of Evil.